For most folks, we started the tour in Tikal NP. Here is our view from Temple IV looking across the undisturbed forest of the Peten. Photo by guide Jesse Fagan. This was a fun trip to Guatemala. 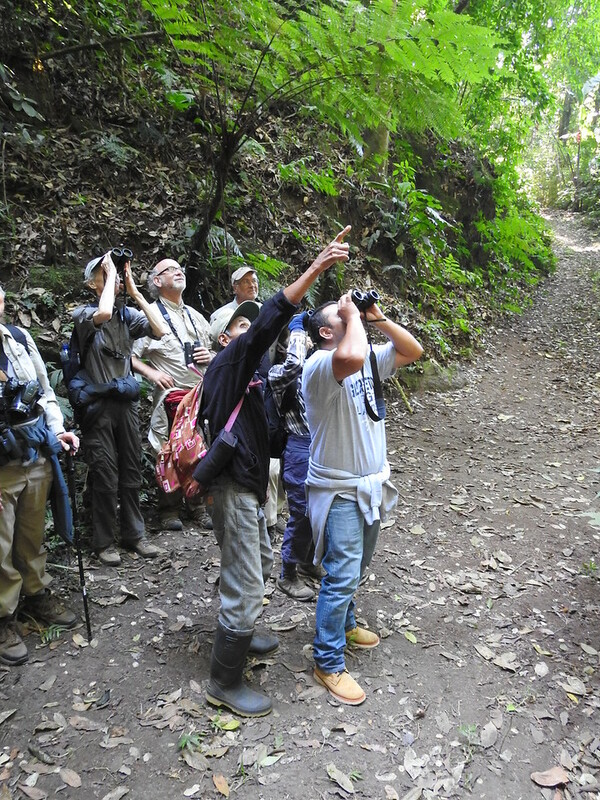 We enjoyed excellent birding in a variety of diverse habitats. We birded under Caribbean lowland jungles covering ancient Mayan temples, in cloud forest draped with intense epiphytic growth, crossed "the most beautiful lake in the world," and felt the ground shake from active volcanoes. We also got to walk colonial streets in Antigua and taste delicious homegrown coffee at several fincas. 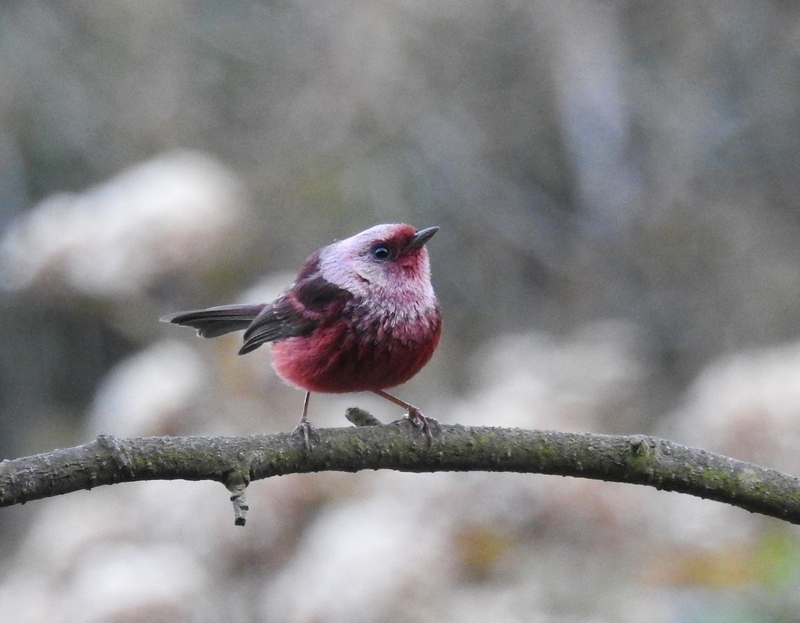 Birding highlights were many: the tiny Wine-throated Hummingbird at Fuentes Georginas, the only slightly larger, Slender Sheartail, on the shores of Lake Atitlan, the unbelievable Pink-headed Warbler on the slopes of Volcan Santa Maria, and the enigmatic Belted Flycatcher seen at Finca Filadelfia. However, none of us were prepared for our Horned Guan sighting! This was definitely the highlight for most folks in the group. GREAT TINAMOU (Tinamus major) – A few folks glimpsed one at Las Guacamayas. Heard by all at Tikal NP. 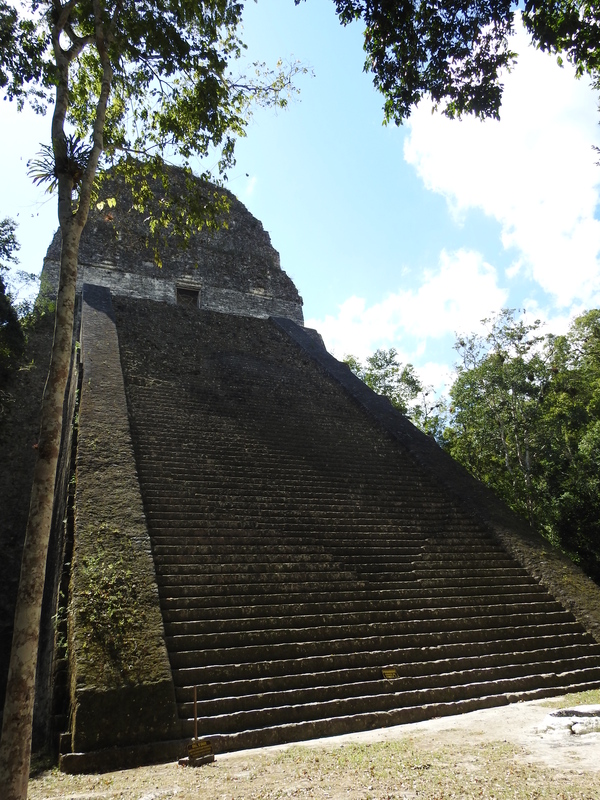 Here is another shot from Tikal NP of Temple V. Photo by guide Jesse Fagan. MUSCOVY DUCK (Cairina moschata) – Wild birds were seen on the Rio San Pedro at Las Guacamayas. WHITE-BELLIED CHACHALACA (Ortalis leucogastra) – Restricted to the Pacific Slope from S Mexico to NW Costa Rica. Seen well at Finca Los Tarrales. HORNED GUAN (Oreophasis derbianus) – One of my most exciting bird moments in a long time. A pair flew across the forest opening above the cabins at Fuentes Georginas. We were all stunned. Awesome! GREAT CURASSOW (Crax rubra) – Wow. Seeing males and females on the trails at Tikal NP was a real treat. BUFFY-CROWNED WOOD-PARTRIDGE (Dendrortyx leucophrys) – A very good bird to see. One of our last new birds of the tour, and right in the city. This Spot-tailed Nightjar seen on our boat ride at Las Guacamayas was the first confirmed record for Guatemala. There was a little detective work involved, but we eventually figured out the mystery! [check out the spots under the tail!] Photo by guide Jesse Fagan. SCALED PIGEON (Patagioenas speciosa) – Small numbers in the Peten region. STRIPED CUCKOO (Tapera naevia) – Seen perched in the scope at Finca Los Tarrales. PHEASANT CUCKOO (Dromococcyx phasianellus) – Fantastic bird! Nice song and a memorable approach by air while birding the old airstrip at Tikal NP. 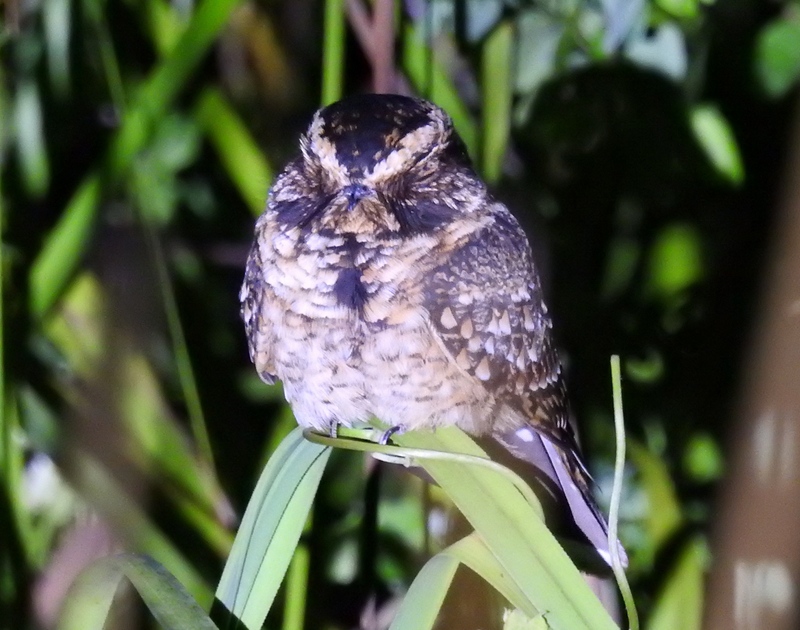 SPOT-TAILED NIGHTJAR (Hydropsalis maculicaudus) – A new record for Guatemala after some good 'ol detective work. Looks like all the recent Yucatan Nightjar records from Las Guacamayas were of this species! YUCATAN POORWILL (Nyctiphrynus yucatanicus) – Wonderful close views at Tikal NP. MEXICAN WHIP-POOR-WILL (Antrostomus arizonae vermiculatus) – Showed well in the light in the pine-oak forest below Finca El Pilar. 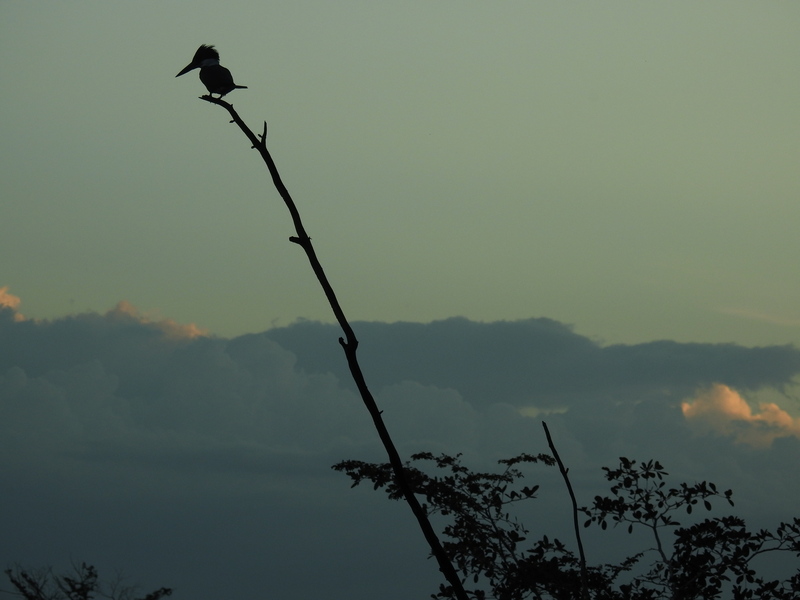 A Ringed Kingfisher waits for the sun to set along the Rio San Pedro at Las Guacamayas. Photo by guide Jesse Fagan. LONG-BILLED STARTHROAT (Heliomaster longirostris) – Seen perched a couple of times at Finca Los Tarrales. SPARKLING-TAILED HUMMINGBIRD (Tilmatura dupontii) – All too briefly at Rey Tepepul. WEDGE-TAILED SABREWING (Campylopterus curvipennis) – A near NCA endemic seen well at various sites in the Peten. Antigua was a lovely base for us for a couple of nights. 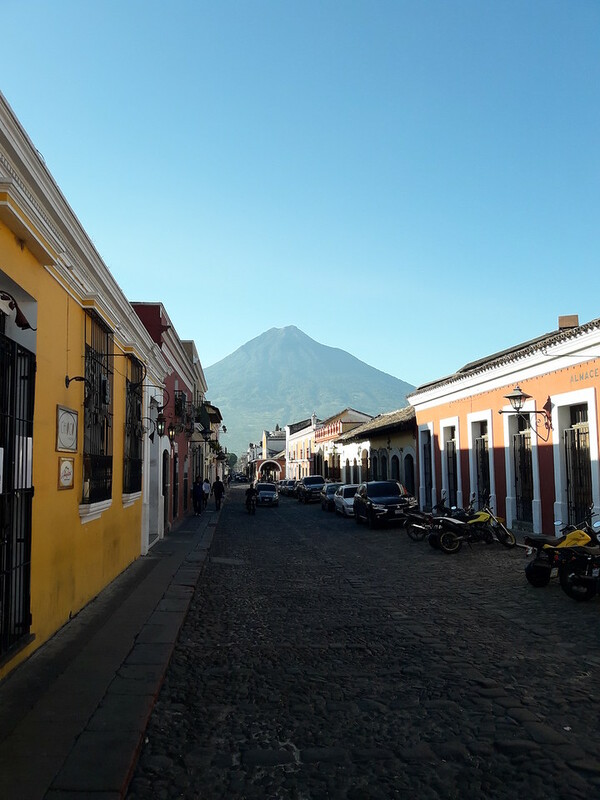 Volcan Agua makes for a spectacular backdrop to the colonial city. Photo by guide Jesse Fagan. BROWN PELICAN (Pelecanus occidentalis) – Several juveniles on Lake Peten-Itza. AGAMI HERON (Agamia agami) – This lovely heron was seen hunting in the shadows on a tributary to the Rio San Pedro. In fact, we saw two different individuals. HOOK-BILLED KITE (Chondrohierax uncinatus) – A gray-morph male was soaring over Fuentes Georginas. ORNATE HAWK-EAGLE (Spizaetus ornatus) – Amazing experience as one came into the forest and perched above our heads at Finca Los Andes. 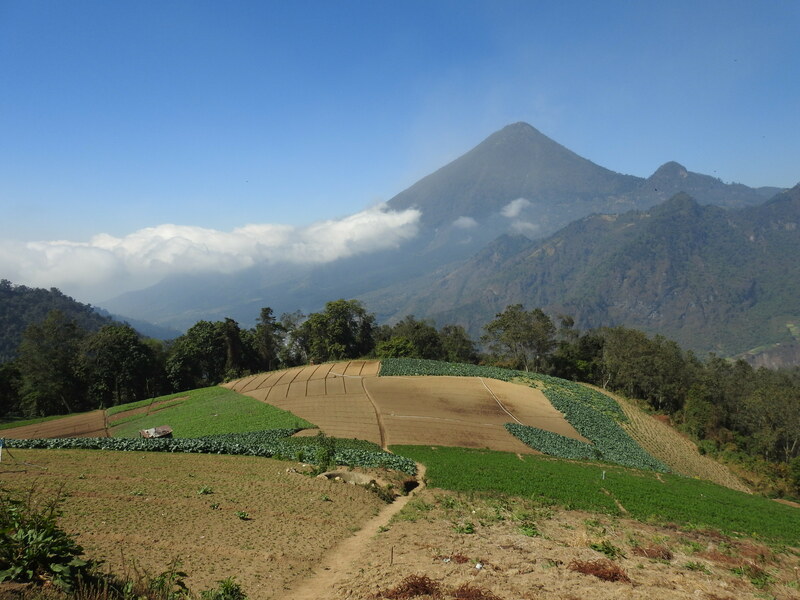 From Antigua we moved to Finca Los Tarrales, where another volcano served as an impressive backdrop. 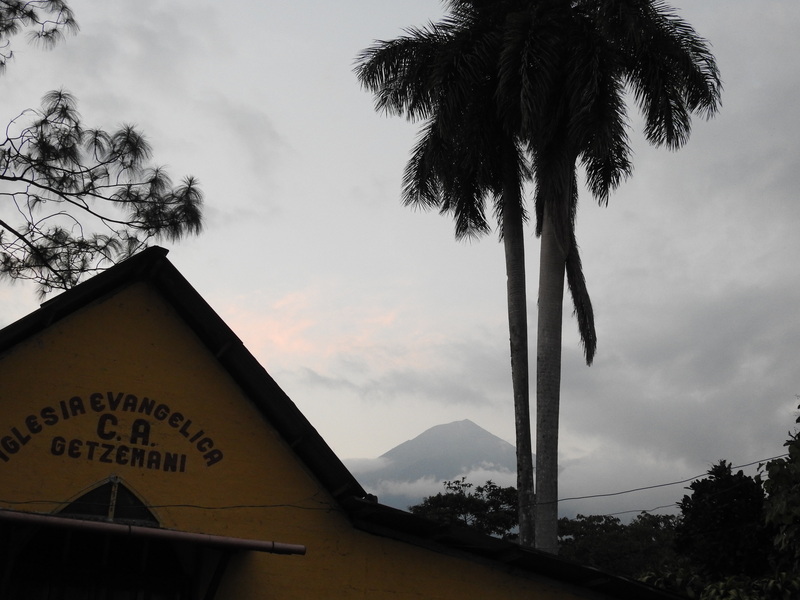 In this case, Volcan Atitlan. Photo by guide Jesse Fagan. BLACK-COLLARED HAWK (Busarellus nigricollis) – One of my favorites and quite rare and local in NCA. Seen along the Rio San Pedro, Las Guacamayas. SHARP-SHINNED HAWK (WHITE-BREASTED) (Accipiter striatus chionogaster) – One zipped by us quickly at Finca El Pilar. WHITE HAWK (SNOWY) (Pseudastur albicollis ghiesbreghti) – A pair stood out in the green forest of Finca Los Tarrales. A beautiful creature. BARN OWL (Tyto alba) – One came out of its limestone cavern around 6:30 pm and passed right over the boat. Very cool. NORTHERN PYGMY-OWL (GUATEMALAN) (Glaucidium gnoma cobanense) – A great experience calling up one in the pre-dawn light at Finca El Pilar. Good work team. RESPLENDENT QUETZAL (Pharomachrus mocinno) – Memorable experience with a pair near a nest box at Finca Los Andes. TODY MOTMOT (Hylomanes momotula) – Seen at Las Guacamayas, but unfortunately, a heard only on the Pacific side. One of the most difficult of the NCA endemics was seen super well on the shores of Lake Atitlan. 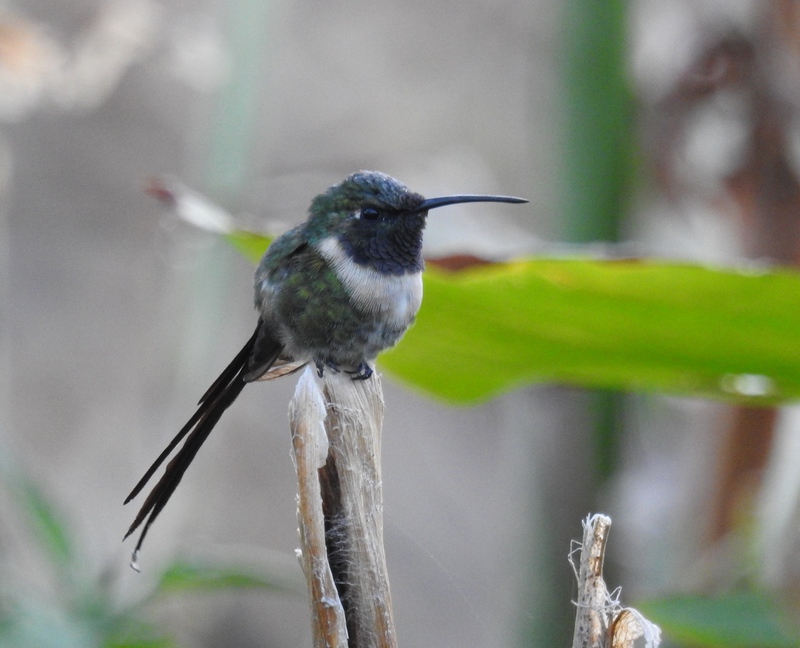 This male Slender Sheartail was photographed by guide Jesse Fagan. WHITE-NECKED PUFFBIRD (Notharchus hyperrhynchus) – We saw both species of puffbirds in the Peten region. KEEL-BILLED TOUCAN (Ramphastos sulfuratus) – There goes the flying banana! Seen well on the Caribbean side. YELLOW-BELLIED SAPSUCKER (Sphyrapicus varius) – One in the parking lot at Tikal NP was a very good wintering visitor record for NCA. YUCATAN WOODPECKER (Melanerpes pygmaeus) – A fairly recent new species for Guatemala; only discovered to occur around Las Guacamayas in the last 5 years or so. GOLDEN-FRONTED WOODPECKER (VELASQUEZ'S) (Melanerpes aurifrons dubius) – Seen on the Caribbean side. GOLDEN-FRONTED WOODPECKER (VELASQUEZ'S) (Melanerpes aurifrons santacruzi) – Seen on the Pacific side. LADDER-BACKED WOODPECKER (Dryobates scalaris) – A new bird for the guide in Guatemala. Rare and local in NCA. BARRED FOREST-FALCON (Micrastur ruficollis) – Remarkable seeing one on the ground just after having caught a small avian prey. The birds around alerted us to its presence. ORANGE-BREASTED FALCON (Falco deiroleucus) – The pair was back nesting on Temple I and II this year. We finally caught up with the Blue-throated Motmot at Rey Tepepul where it posed nicely. Photo by guide Jesse Fagan. BARRED PARAKEET (Bolborhynchus lineola) – Just seeing a flock of 20 birds zip by at Finca El Pilar was a good sighting for this rare species. YELLOW-NAPED PARROT (Amazona auropalliata) – Good numbers were around the lodge at Finca Los Tarrales. Their sounds resemble small human babies trying to talk (at least to my ear!). TAWNY-THROATED LEAFTOSSER (Sclerurus mexicanus) – A responsive bird was near the trailhead to the big forest at Finca Los Andes. SCALY-THROATED LEAFTOSSER (Sclerurus guatemalensis) – Seen super well along the entrance road to Tikal NP. It perched for a long time. RUDDY WOODCREEPER (Dendrocincla homochroa) – It was an amazing experience watching the army ant swarm at Tikal NP which included Ruddy, Tawny-winged, and Northern Barred-Woodcreeper. Just like the illustration in the guide! RUFOUS-BREASTED SPINETAIL (Synallaxis erythrothorax) – Very good looks at this understory skulker. 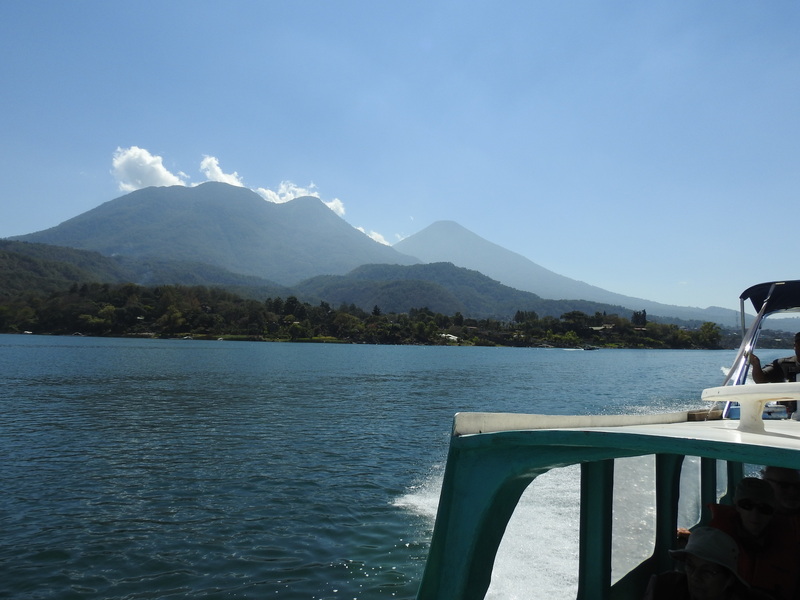 After birding Lake Atitlan, we crossed Lake Atitlan under fantastic skies with memorable views of the volcanoes. Photo by guide Jesse Fagan. GUATEMALAN TYRANNULET (Zimmerius vilissimus) – A split from the old Mistletoe Tyrannulet. This has now become an NCA endemic! I am not totally convinced yet. Good numbers were seen/heard on the Pacific Slope. ROYAL FLYCATCHER (NORTHERN) (Onychorhynchus coronatus mexicanus) – Great looks at this species on the old Tikal airstrip. LONG-TAILED MANAKIN (Chiroxiphia linearis) – Always a treat to see the male of this species. We had a cooperative male at Finca Los Tarrales. "Toledo!" is their call and local name. This impressive large dust devil or tornado was seen as we descended towards Xela in the Guatemala highlands (elev. 8200'). Video by guide Jesse Fagan. NORTHERN SCHIFFORNIS (Schiffornis veraepacis) – A recent split of Thrush-like Schiffornis has the taxon in NCA called Northern Schiffornis, or by some authorities, Northern Mourner. 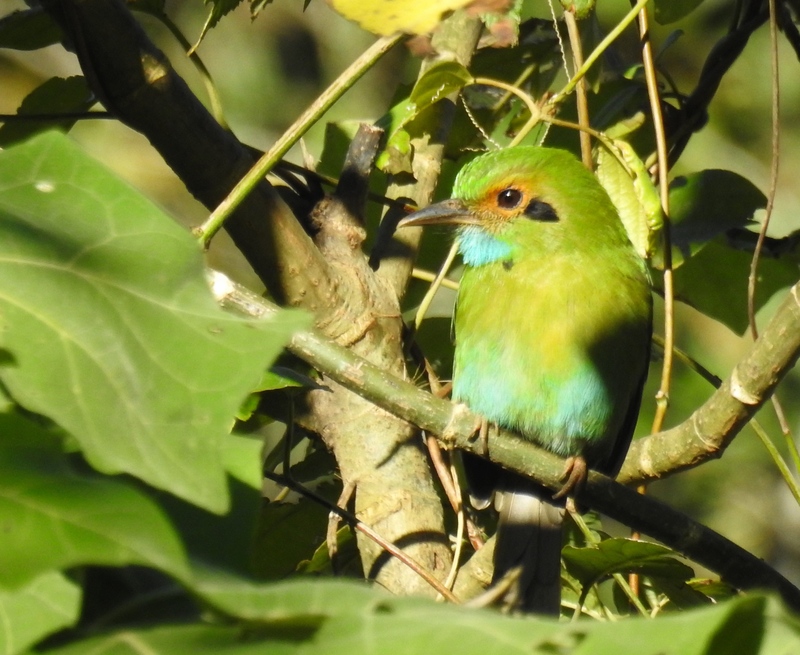 GREEN SHRIKE-VIREO (Vireolanius pulchellus) – Impressive showing at Tarrales of this often difficult canopy species. PLUMBEOUS VIREO (CENTRAL AMERICAN) (Vireo plumbeus montanus) – I was happy to see this resident Plumbeous subspecies at Tarrales; this will be an armchair tick, trust me. UNICOLORED JAY (Aphelocoma unicolor) – Great looks at Fuentes Georgina, one of the first birds we laid eyes on! NORTHERN ROUGH-WINGED SWALLOW (RIDGWAY'S) (Stelgidopteryx serripennis ridgwayi) – This resident subspecies was seen around the ruins of Tikal. VIOLET-GREEN SWALLOW (Tachycineta thalassina) – Just one seen flying above Rey Tepepul. Incredible views of Pink-headed Warbler were had at Los Llanos del Pinal. One of the more striking of the NCA endemics. Photo by guide Jesse Fagan. CAROLINA WREN (WHITE-BROWED) (Thryothorus ludovicianus albinucha) – One seen at Tikal NP in the dry forest. A potential split in the future. Call note is very different. HERMIT THRUSH (Catharus guttatus) – We saw this rare wintering visitor at Finca El Pilar. The views from Fuentes Georginas were...well, AWESOME. Photo by guide Jesse Fagan. HOODED GROSBEAK (Coccothraustes abeillei) – Nice looks at Finca Filadelfia. WHITE-EARED GROUND-SPARROW (GRAY-CROWNED) (Melozone leucotis occipitalis) – Both Melazone sparrows were seen well. They are neat species. White-eared surprised us at Finca El Pilar and we finally caught up with White-faced at Finca Los Andes. 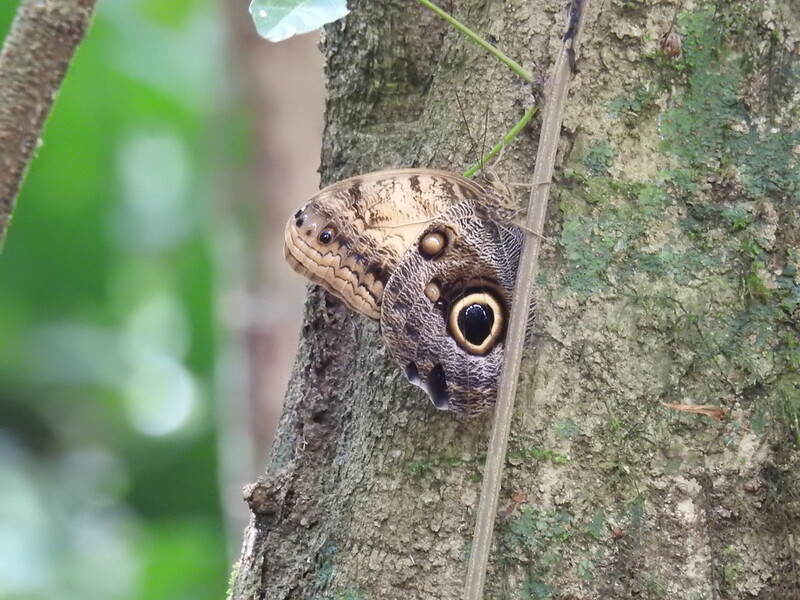 This owl butterfly, Caligo telamonius, was photographed by guide Jesse Fagan at Finca Los Andes. YELLOW-TAILED ORIOLE (Icterus mesomelas) – Seen at Las Guacamayas. One of the less common and more local orioles to see in NCA. LOUISIANA WATERTHRUSH (Parkesia motacilla) – One was near our lunch spot in Tikal NP. The habitat seems unusual for this species which makes me think they were migrants. CRESCENT-CHESTED WARBLER (Oreothlypis superciliosa) – We saw this species well at Finca El PIlar . It has a buzzy, insect-like call. HERMIT WARBLER (Setophaga occidentalis) – One at Finca El Pilar was a good pickup for us. Not seen every year on this tour though they winter in small numbers in NCA. Here our guide at Finca Los Andes, Don Chus, points out a Resplendent Quetzal to our driver, Mauricio. It was the first time he had ever seen a quetzal. Photo by guide Jesse Fagan. RED-FACED WARBLER (Cardellina rubrifrons) – Good bird to see in Guatemala. We had one at Finca El PIlar. Rare to uncommon winter visitor to NCA. ROSE-THROATED TANAGER (Piranga roseogularis) – We caught up with this mostly Yucatan endemic at Tikal NP. A pair came in to check us out. BLACK-THROATED SHRIKE-TANAGER (Lanio aurantius) – Good numbers in the tall forest at Tikal NP this year. We marveled at the showy display of the male Resplendent Quetzal to the female nearby. Video by guide Jesse Fagan. 1) Morelet's Crocodile (Crocodylus moreletii) = Its range includes Mexico, Belize, and Guatemala. We saw this species in the Peten at Tikal NP and again in Las Guacamayas. Pierre Marie Arthur Morelet was a French naturalist in the 19th century. I assume this is also the same person from which is named Morelet's Seedeater (Sporophila morelleti).